It is about 32-38 mm long as an adult and is also reddish-brown to dark brown with a characteristic marking behind the head. On the front edge of the base of the forewing, there is a light yellow band. Nymphs have light yellow spots on the top of their abdomens. The Australian cockroach is abundant outdoors and in greenhouses, where it can damage plants. 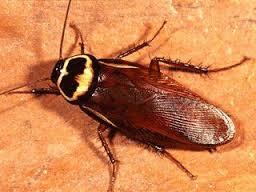 It also has been known to enter homes and be referred to as a palmetto bug.